Miami Trace sophomore Gracee Stewart crosses the three-point line during a non-conference game against Wilmington Tuesday, Jan. 22, 2019 in the Panther Pit. Pictured for Wilmington is sophomore Emily Self. 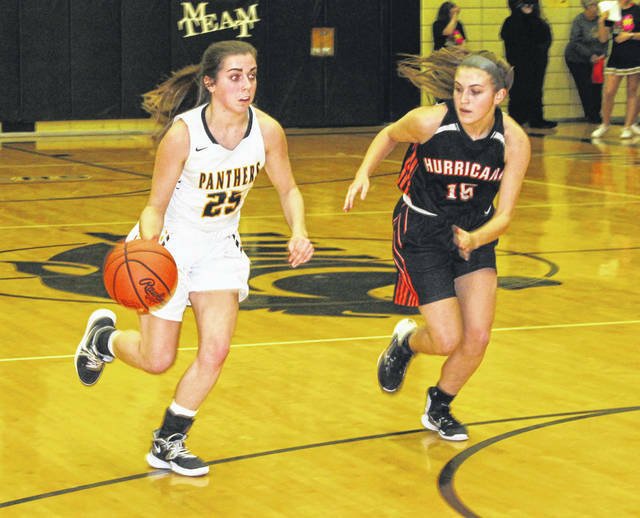 A large crowd turned out Tuesday night for one of the very last games in the Panther Pit when the Lady Panthers welcomed former South Central Ohio League opponent Wilmington for a non-conference game. After a close first half and after trailing by as many as eight points in the third quarter, Wilmington came roaring back to post a 60-39 victory. Wilmington improves to 12-4 overall. Miami Trace is now 9-6 on the season with a game at home Wednesday night against Chillicothe. Junior Shay McDonald led Miami Trace with 12 points. She also led her team with seven rebounds. Senior Cassidy Lovett had 11 points and seniors Olivia Wolffe and Tori Evans each added six points. Senior Mya Jackson was the game’s leading scorer for Wilmington with 20 points, giving her 1,807 career points. Junior Jasmine Jamiel scored 13 points for Wilmington and junior Sami McCord scored 12. The game was tied 12-12 at the end of the first quarter and Miami Trace held a 26-21 halftime lead. At one point in the third quarter, Miami Trace led by as many as eight points. However, Wilmington outscored the Lady Panthers, 17-7 in the third quarter to lead 38-33 heading into the fourth quarter. The Hurricane poured it on in the fourth, scoring 22 points to six for Miami Trace for a 60-39 final. “I thought we got a little tired in the third quarter,” Miami Trace head coach Ben Ackley said. “Their pressure out front gave us a lot of trouble. That’s the most we’ve struggled out front against pressure in a long time. Give them credit; they really amped the pressure up in the second half. Their defense turned into offense for them. Wilmington is back at home Thursday for a Southern Buckeye Athletic & Academic Conference game against Western Brown. MIAMI TRACE — Olivia Wolffe 1-4-6; Cassidy Lovett 3 (1)-2-11; Becca Ratliff 0-0-0; Aubrey McCoy 0-0-0; Shay McDonald 3 (2)-0-12; Tori Evans 0 (2)-0-6; Magarah Bloom 0 (1)-0-3; Reagan Barton 0-0-0; Aubrey Wood 0-0-0; Gracee Stewart 0-1-1; Lena Steele 0-0-0. TOTALS — 7 (6)-7-39. Free throw shooting: 7 of 10 for 70 percent. Three-point field goals: McDonald, 2; Evans, 2; Lovett, Bloom. Field goal shooting: 13 of 44 for 30 percent. Three-point field goal shooting: 6 of 16 for 38 percent. Rebounds: 19 (7 offensive). Turnovers: 14. Assists: 6. Steals: 5. Fouls: 14. WILMINGTON — Jasmine Jamiel 5-3-13; Mya Jackson 5 (2)-4-20; Emily Self 2 (1)-0-7; Sami McCord 4 (1)-1-12; Chailyn Johns 0-0-0; Jenna Victor 0-0-0; Tiara Harris 0-0-0; Maura Drake 1-0-2; Karlie Morgan 3-0-6. TOTALS — 20 (4)-8-60. Free throw shooting: 8 of 10 for 80 percent. Three-point field goals: Jackson, 2; Self, McCord. Field goal shooting: 24 of 40 for 60 percent. Three-point field goal shooting: 4 of 12 for 33 percent. Turnovers: 11. Offensive rebounds: 6.